Mother's Day is right around the corner and it's not too early to start thinking about ideas for the special mothers in your life... especially those who love flowers! Fortunately, I'm going to make things a little easier for you with some wonderful gift suggestions from Quarto Publishing Group! 100 FLOWERS: ONE HUNDRED POSTCARDS FROM THE ROYAL HORTICULTURAL SOCIETY is an gorgeous collection of botanical artwork dating from the late 17th century or early 18th century to the middle of the 20th century. 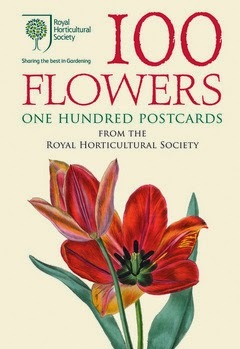 There are 100 different postcards in this set featuring beautiful floral paintings from the Libraries of the Royal Horticultural Society's collection. You can send these postcards to friends, but there are so lovely that you might want to keep them for yourself and frame them! I was not only impressed with the variety of floral art, but I was also extremely impressed with the quality of these postcards. This set is ideal for art and flower lovers alike! Summary: Keep your thoughts and ideas in this beautifully illustrated Spring Daisy Journal. Perfectly travel-sized, this nature-themed lined notebook is the perfect place to keep your stories, poems, sketches, and quotes. Featuring artwork by Jane Dixon, a renowned illustrator and designer,the interior has graphic illustrations of flowers, gardens, and daisies, as well as inspirational quotes from philosophical thinkers. - 8 illustrated inspirational quotes. 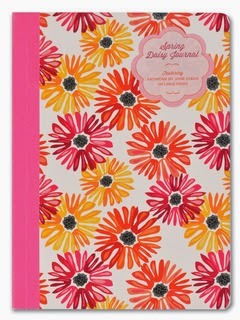 What woman wouldn't appreciate this adorable SPRING DAISY JOURNAL featuring artwork by Jane Dixon? I certainly would love receiving this cute journal to capture my daily thoughts or even to track my reading list! This book contains 128 lined pages and includes full color artwork on every page. There are also eight inspirational quotations that appear throughout the journal. The SPRING DAISY JOURNAL is just a perfect gift for this time of year. The gorgeous spring colors are guaranteed to brighten any mother's day! 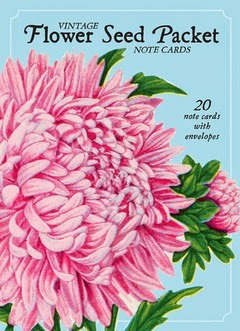 Summary: Twenty vintage flower seed packet note cards make your relationships bloom - just add your personal message! Modern technology has given us so many ways to contact each other. It's wonderfully convenient, but can leave a little to be desired. Messages of love, thanks, and appreciation deserve a more personal touch. A heartfelt, handwritten note will never go out of style! Send a special note on one of these vintage flower seed packet note cards. The collection includes Twenty cards, five each of four designs, featuring the colorful and artistic seed packet designs from yesteryear, plus a corresponding colorful envelope. The note cards are blank inside for the ultimate in personalization, but each type also has a brief description of the featured art for a little added touch of history. An attractive, hinged-lid gift box with a magnetic enclosure keeps the cards organized. A ribbon loop makes the box easy to open. This set is great for personal use or gift-giving. The cards are perfect as thank-you cards, to include with a gift, and for dashing off a note to stay in touch with loved ones. And last but certainly not least is the VINTAGE FLOWER SEED PACKET NOTE CARDS. This boxed set includes 20 quality note cards with envelopes and has absolutely stunning artwork featuring a variety of vintage flower seed packets. There are four different note cards (that's five of each card if you're counting!) as well as pretty blue envelopes. I am probably one of the few people who still use note cards on a regular basis, but I love having nice cards to use for a quick note or thank you note. This set couldn't be more elegant with it's hinged and magnetic storage box, ribbon flap and high quality paper. In addition, each note card has a little description of the artwork to provide some background on the individual seed packets! As cute as these three items are, Quarto Publishing Group has many more items that are perfect for the upcoming Mother's Day holiday. There are items for just about any type of mom including ones who love literature and nature, and there are even some really cool ones for the "funky" mom in your life! Make sure you check out their collection here. Thanks to Quarto Publishing Group for providing review copies of these items. I use note cards all the time too and love that set! These are right up my alley :-) Heading off to check out the site. Thanks for blogging about these items! Great ideas! Love the note cards. These all look lovely! I like sending postcards and notes as well, will have to check this out!